In bowl, beat together butter and brown and granulated sugars until light; beat in egg and vanilla. In separate bowl, whisk together flour, oats, flaxseeds and baking soda; stir into butter mixture until soft dough forms. Drop by level tablespoonfuls (15 ml), 2" (5 cm) apart, on ungreased rimless baking sheets. Bake in top and bottom thirds of 350 °F (175 °C) oven, rotating and switching pans halfway through, until golden, 12 minutes. Let cool on pan on rack for 2 minutes. Note: based on recipe from The Canadian Living Test Kitchen. 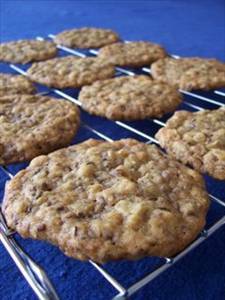 There are 77 calories in 1 serving of Flax Cookies. Calorie split: 44% fat, 48% carbs, 8% protein.